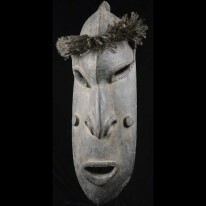 Colorful Middle Sepik River Gable Ancestor Mask. Masks like this are protector ancestor images that are hung on the gable of men’s houses. 25.5 inches tall.